Late last year, NVIDIA surprised everybody with the launch of its Ion platform, a concept that was to forever bind an energy-efficient GeForce motherboard GPU with one of Intel's most successful products to date, the Atom processor. Although the platform was appreciated by leading industry players like Microsoft and Google, system vendors were late to announce a product that would take advantage of the features made available by NVIDIA's new pride and joy. However, after months of anticipation, the first NVIDIA Ion-based product made its official debut, with Acer being the first system vendor to announce one. Although it was initially rumored as the Acer Hornet, the first NVIDIA Ion product was launched as the Aspire Revo, a small-sized nettop capable of providing users with a true home entertainment solution. The desktop computer system featured a design similar to that of Nintendo's much-hyped Wii gaming console, while providing the end user with a choice for a low-power PC, capable of delivering support for some gaming applications, Microsoft Windows Vista and 7 operating systems, as well as 1080p video. Even if Acer initially outed the product back in early April, the nettop had some difficulties becoming available to the market. Reviews came in late, as they were published towards the end of April. Still, after a few months with Aspire Revo out in the open, Acer can now observe how the collaboration with NVIDIA will provide it with an increased market share in the nettop segment. Developed together with the well-known US network operator AT&T, the new Samsung A867 Eternity will be exclusively sold under the carrier's brand. The handset comes to fill in a niche of buyers that are looking for a cheaper version of Omnia. Even though Samsung Eternity is not a business phone and doesn't carry an operating system, it looks almost the same in terms of design. Samsung Eternity is mostly sold in the States, but unlocked versions of the device can also be bought from Europe, Asia or any other continent, as the phone is quad-band. PureMobile was kind enough to borrow us a brand new final version of the bar phone, so we're now able to test and review it. 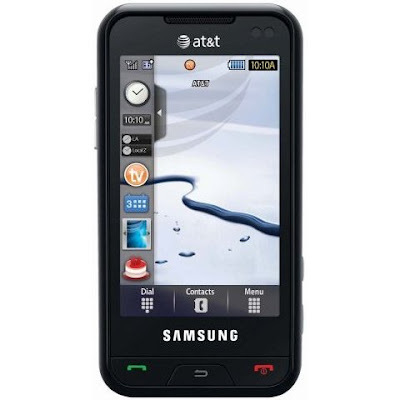 Samsung A867 Eternity was announced in November 2008 and made it on shelves the next year, in January 2009. AT&T began to sell the phone for $149.99 after contract and rebate, but the unlocked version can be acquired for around 400USD. While it may look the same up-front compared to Samsung's Omnia smartphone, Eternity is much lighter and a little bit smaller. The bar form of the touchscreen phone has become a standard for all the latest Samsung phones that are running the famous TouchWiz interface. Pocketsized and with good ergonomics, Samsung Eternity is sure to stand out from the crowd. It measures 109 x 56 x 13 mm and weighs 110g (including battery), which brings it so close to Omnia (112 x 56.9 x 12.5 mm). The reason that Eternity is so light is the fact that it has been entirely manufactured from plastic. Even the silver stripe that surrounds the phone is also pure plastic, specially painted, so it gives you the impression of metal. The same applies to the back cover of the phone. The front part of the phone is covered by a shiny plastic with good finishes that will be full of fingerprints in no time. The 3.2-inch touchscreen makes up almost the whole front part of the device. You'll notice above it, a little bit on the right of the in-call speaker, an ambient light sensor. The right side of the phone features a dedicated camera button and a shortcut key (Dial pad, Music player, Main menu, MediaNet, Messaging), but also a 3.5mm jack port. On the left side of the handset, there's a dual volume key, as well as the proprietary Samsung port that can be used to attach headphones, the USB cable or charger. On top of the phone there's a special Hold key that will lock the touchscreen or will wake up the phone if it's in stand-by. There are three available keys displayed under the big screen: the Accept and Reject calls keys, but also a Back one. The latter opens the Calendar function by default, but can be set to open almost any function of the phone. The back of the phone features a 3.2-Megapixel camera with no other improvements. The back cover can be easily removed by sliding it down. Overall, Samsung Eternity seems to be pretty sturdy, but it has some parts, which are somewhat unprotected: the display, the camera, and the plastic casing. Samsung Eternity embeds a 3.2-inch TFT resistive touchscreen, supporting 262k colors and featuring an accelerometer sensor. The colors displayed on the screen are well-balanced, the contrast is good and the brightness can be set to any desired level. The visibility in the sunlight is medium, which means that you'll be able to use it when outdoors. The touchscreen features the haptic technology, so the feedback when using the display is cool to experience. Furthermore, the usual lag when the accelerometer sensor is activated and the screen is turned in landscape mode disappeared and you won't notice anything. The 3.2-Megapixel camera doesn't feature any other improvements like flash, autofocus, or self-portrait mirror. It's been left unprotected, so you should take care not to scratch it when you're not using the phone and keep it in your pocket. Consequently, don't bother to make night pictures and don't expect too much quality. The camera freezed my phone once, but I couldn't detect the cause. The maximum resolution of the pictures is of 2048 x 1536 pixels, while movies can be recorded using a maximum resolution of 320x240 pixels. The camera interface looks much the same as Pixon's, but lacks many settings. It is user-friendly, as you are always one or two clicks on the touchscreen away from any setting or function. While the phone lacks auto-focus, it still takes some average quality pictures. The shots included below reveal some good pictures, but don't think of it as a camera phone, because you'll be disappointed. The pictures are saved in about three seconds, so it doesn't lag too much, but as I have already mentioned above, I think that sometimes it freezes your phone. Pictures can be taken in portrait or in landscape mode. The phone can record QVGA movies at 15fps with no problem, but the quality is much lower than expected. Overall, I believe that Samsung Eternity wasn't destined to be a camera phone, but I was surprised to find that it snapped pretty well, even though it lacked any kind of features. Samsung Eternity features the so-praised TouchWiz interface that works very well with the latest Samsung touchscreen devices that lack an operating system. The shaking control and the accelerometer sensor are very functional, and make the device more appealing and user-friendly. The Home screen has a menu bar on the left side that works just like a Windows Taskbar. Samsung's taskbar is hidden, and can be displayed after touching it. You can add or delete any programs or functions you want, by simply dragging them in or out of the bar. The phone has full customization features and can be set to look exactly as you want it to. The control is easy and can be done in two ways: touch and swipe. The latter will certainly remind you of Apple's iPhone, which is controlled mostly through swipes on the touchscreen. Eternity features lots of AT&T dedicated programs such as AT&T Music, TV, CV, AT&T GPS, MEdia Mall, MEdia Net and Yellowpages. In terms of productivity tools, the device includes: Memo, Task, World clock, Calculator, Convertor, Music player, Photo browser, Voice recorder, Timer, Stopwatch, RSS reader, Games, and many more. Of course, The Widget is also present and fully customizable. The phone also features a Java emulator, which supports almost any Java application and game. The phonebook accepts up to 1,000 entries and around 500 SMS messages. The phonebook features an innovative way to search the name of the contact. By simply touching the small magnifying glass that appears in its upper left part and dragging in it down or up, you'll be able to scroll between the alphabet letters. Samsung Eternity features the HSDPA (3.6 Mbps) technology, besides the usual EDGE (Class 10, 236.8 kbps). Although the NetFront Internet browser has been updated to version 3.5, it still lacks the speed of a Nokia phone. Depending on how much information needs to load, the pages are loaded fast enough with this updated browser, and users can take advantage of the large screen, landscape mode or the mini-map function, which can be controlled with the zooming buttons on the right side of the phone. Other connectivity solutions include USB 2.0 and Bluetooth 2.0 with A2DP support. The phone can also be used as a modem with a PC in case you need one. Unfortunately, the phone doesn't come with any cable for PC synching, so you'll need to buy one. If you're not an AT&T subscriber and not living in the US, the GPS receiver is somewhat useless, as it only works with the AT&T Navigator application, which is Java-based. Besides the basic message support (SMS, EMS and MMS), the email client is compatible with POP or IMAP accounts. Furthermore, you'll be able to set the email client to check for new messages whenever you feel like. There are also three IM services available: AIM, Windows Live and Yahoo!. The quadband (GSM 850 / GSM 900 / GSM 1800 / GSM 1900) -network compatible device has a very good GSM signal reception, even when using the UMTS network. The sound is mediocre, pretty clear, but somewhat low. I haven't experienced any drops in signal reception, or missed a call while talking on the phone. The vibration is pretty intense, so you'll have a low percentage of missed calls even when the Silent profile is activated. My guess is that Samsung Eternity features a medium-powered ARM11 family processor that runs at speeds up to 220 MHz. The CPU is enough to run multiple applications in the background with no problems whatsoever. The interface is pretty snappy and much faster than that of LG phones. The embedded Java emulator can handle any compatible large-size files, so 3rd-party applications can be installed with ease. The phone comes with 200 MB of internal memory, but features a microSD memory card slot to expand the storage space up to 8GB. Unfortunately, the card slot is placed under the back hood near the SIM card, which means that it's not hot-swappable. Samsung Pixon features a touch-compatible music player that supports MP3, eAAC+, WMA, AMR files, but also an FM radio with an RDS function. Both can be run in the background, or you can set their shortcuts on the taskbar in the home screen. The phone includes no headphones in the sales package, but at least it features a 3.5mm port, which enables the option to connect the headphones there. The sound quality of the music player is average to low. In fact, I didn't like it at all. The music player features an equalizer: Rock, Pop, Dance, Jazz, Classic, Wide, Dynamic and Surround. The last one proves to be an innovation, as the phone can be attached to a 5.1 channel sound system through a 3.5mm jack. The XM Radio included doesn't work unless you're an AT&T subscriber. Samsung Eternity features a 1330 mAh Li-Ion battery with a stated time of 250 hours in standby mode, and five hours in talk-time mode. For a heavy user that spends two-three hours a day talking on the phone, it needs to be recharged once every two-three days, but a soft user should do just fine with one recharge at every four days. Overall, this is a high-capacity battery of small dimensions that barely adds to the weight of the phone. 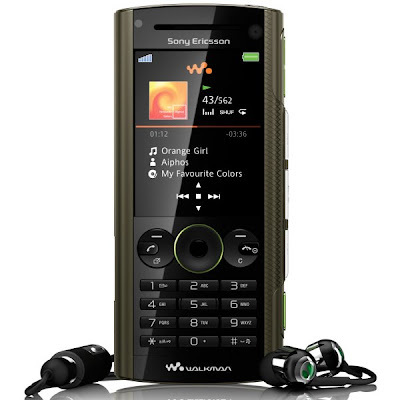 One of the nicest surprises coming from Sony Ericsson last summer was its top-of-the-line Walkman-series handset – W902. Even though the Walkman series focuses on multimedia features, the W902 includes some Cyber-shot traits such as 5 Megapixel camera with geo-tagging, autofocus, LED flash and image stabilization. Moreover, the quality of the module camera seems to be on par with high-end Cyber-shot-series handsets, which makes it the first mobile phone that can be tagged both as music device and a camera phone. Add to that the exceptional headset included in the package and the 8GB M2 memory card and you have one of the most promising handsets coming from the Swedish-Japanese company. Announced in July 2008, Sony Ericsson W902 was made available on the market in October the same year, and even if it seems to have been discontinued it can still be bought for around 450USD unlocked and free of plan, but that depends on the location. Users can choose one of the three available colors, namely Volcanic Black, Wine Red and Earth Green. This is one of the main problems that the Swedish-Japanese joint venture had in the past with its handsets – boring and obsolete designs. Well, that hasn't stopped its fans from buying its product, which finally propelled the company on a meritorious third place before the economic crisis crash. Nevertheless, since then SE sales have gone down and something new and innovative had to be quickly found and exploited. Today, design is one of the most important features for a new phone. Unfortunately, Sony Ericsson seems to have started to care about that only lately and the W902 is one of the first to take advantage of this change in the company's views. Even though the phone still resembles its Walkman-series predecessors, it approaches a new form that is supposed to make it stand out from the crowd. Medium sized (110 x 49 x 11.7 mm) and weighing a little bit under 100g (99.8g including battery), Sony Ericsson W902 distinguishes itself through its external music controls that can be found all over the right side of the device. To be sure that these can be used even with the phone kept in a pocket, Sony Ericsson preferred to add 1mm to the size and make the controls bulging from the main body of the handset. Starting from the top, you'll be able to easily find the dual volume keys, Forward, Play/Pause and Previous music keys and a dedicated camera key. The left side only features the universal proprietary Sony Ericsson port for charge and PC synchronization. On top of the handset you can notice another dedicated music button that opens the music player. It looks just like a power off/on that is usually found on Nokia devices, but this one features an inscribed Walkman icon. On the bottom of the handset there's a small-sized gap where the mic has been placed. Above the 2.2-inch display there's a secondary videocall camera and a small light ambient sensor. The keypad layout doesn't come up with anything new, except for the fact that you can now click every key with ease. The only thing I found a little bit annoying were the controls around the small joystick. There are three available keys crowded on each side of the joystick: 2 soft keys, Accept and Reject calls keys, Shortcut key and C (Delete) key. Otherwise, the keys are a little bit hard to press, but you will get used to it pretty fast. On the back side of the phone Sony Ericsson included a 5 Megapixel camera, and the only protection against scratches seems to be the fact that it has been embedded a little bit lower into the body of the case. Above the camera there is a LED flash, while on the bottom left of the back hood there is a nice loudspeaker. Unfortunately, I think Sony Ericsson could do much better in terms of material used for manufacture, which is a thin plastic. A little bit of metallic material would've made it more desirable. Still, Sony Ericsson W902 is a step forward in terms of design and ergonomics. While, the candybar hasn't been too solidly built, it feels pretty compact in hand, with the exception of the back cover, which seems rather flimsy. The only disappointment regarding the W902's display is its rather small size, at only 2.2 inches. Coated in mineral glass, which makes it more resistant to scratches, the screen supports 262K colors and a 240x320 pixel resolution. Contrast and brightness are exceptionally good, but the main attraction is the fact that it is perfectly visible in the sunlight. For more in-depth info regarding performance, check out the benchmarks below. The 5 Megapixels camera of the candybar is definitely one of the best features of the phone. It seems the camera module is the same that its Cyber-shot predecessor, C902, has included. It features auto-focus, PowerLED (also available as video light when recording clips in darker areas), image stabilization, geo-tagging, BestPic, macro mode and video recording capabilities. The geotagging function (“the process of adding geographical identification metadata to various media such as photographs and videos” – Wikipedia) only works based on Cell-ID triangulation as the phone doesn't feature a built-in GPS receiver. Still, the results are pretty much precise, so you can choose to view the pictures displayed on a map in accordance with the place you took them in. The interface of the camera is pretty complex, but user-friendly. Even though it misses the Face recognition feature, it still has the rest of the Cyber-shot functions including the camera interface layout, which looks the same. The maximum resolution of the pictures is of 2592 x 1944 pixels, while the size varies between 1-1.3 MB. Thanks to the accelerometer, you can easily take pictures in portrait or landscape mode. The quality of the photos is much better than in any other Walkman series handset and comes near those excellent Cyber-shot camera phones. The noise effect is kept within limits, the contrast is pretty good, the level of detail is above average. There are still two downsides that I found while studying the results of the shootings: the “purple effect” is still present and most of the pictures are oversharpened. In terms of video recording, the device captures movies in the QVGA resolution at 30fps in MPEG4 file format. It records movies with stereo sound, but the quality is lower than expected. Overall, Sony Ericsson W902 is the best solution for those looking for a music phone, but who don't want to make any compromises regarding the camera phone abilities. Sony Ericsson W902 features the company's proprietary GUI, which has become known over the course of time. There are some updates in terms of device personalization and looks, but basically there's nothing really new. The same Media center introduced together with the K850i model has also been added to W902, including the auto-rotate feature. There's also support for Flash Lite 2.0, so users can now take advantage of various animated themes, but also of some other Flash-based entertainment utilities. They get to choose from five different themes, each with its own specific abilities. The main menu layout can be changed in accordance to the theme, or by choosing one of these options: grid, rotating and single icon. Wallpaper, startup screen and screen saver can also be personalized according to the user’s need. Also, there are seven profiles to choose from, more specifically Normal, Meeting, In car, Outdoors, Handsfree, Home and Office. Besides these, W902 also includes a Flight mode, in case users don't want to use the GSM function of the handset. There are a few productivity tools that can be employed, such as Alarms (limited to 5), Tasks, Notes, Calendar, Timer, Stopwatch, Calculator, Light, AccuWeather, Music Quiz, Standby World, WalkMate, Code memo and a basic File manager. Besides these the candybar features a dedicated Java YouTube client, which enables users to watch and upload clips. The Internet icon, as the name suggests, gives access to basic Web browsing. Sony Ericsson W902 features the latest Access NetFront HTML browser 3.4, which seems to open any webpage, no matter how elaborated it is. I have noticed that it takes forever to open a webpage when using the EDGE connection, so I suggest using the 3G network when browsing the Internet, as speeds are much better. The Radio only works when the wired earphones are inserted. Location Services is the place where you can find the Google Maps application. Because the device lacks a built-in GPS receiver you do not get the Wayfinder software. The Entertainment sub-folder contains a few functions more or less specific to the Walkman-series devices, namely TrackID, MusicDJ, PhotoDJ, VideoDJ, Record sound, Remote control and Games (FMX III, Need for Speed ProStreet and Jewel Quest2). The Gallery can be found through the File manager in the folder called Camera Album, or in the Media center, and can also be accessed through the camera interface menu. The Java emulator works with just about any compatible application, like games or productivity software. Let's not forget the new service available from Sony Ericsson, Play Now, which offers maximum entertainment. Overall, SE's W902 user-interface puts to your disposal quite a number of features and high functionality, but still remains old. Sony Ericsson W902 Walkman features the basic connectivity tools, but has also been gifted with the HSDPA 3.6Mbps technology, which greatly improves data transfers. When benchmarked, the phone attained outstanding speeds: 1,316 Kbit/s download and 195 Kbit/s upload in 3G network. EDGE data transfers have been a little bit lower than expected, but still reached speeds of 189 Kbit/s for download and 67 Kbit/s for upload services. The handset is also compatible with Bluetooth 2.0 with A2DP technology and features USB 2.0 connectivity. I experienced data transfer speeds of up to 105 KB/s when sending files, and of 138 KB/s when receiving them through Bluetooth connectivity, which is a little bit above the average. Applications like Google Maps have no real use until you get an external GPS receiver, but you will also need something like Wayfinder Navigator 7, so your device will really come in handy with localizations. Messaging capabilities have been improved and now offer a wider range of options. All messages share the same Inbox, except for emails, which have a separate one. You can now manage and categorize them the way you want, or you can simply use the pre-installed categories: Business, Favorites, Follow Up, Fun, Holiday and Important. The email service is fully compatible with the POP3 and SMTP clients. The quad-band (GSM 850 / 900 / GSM 1800 / GSM 1900) network-compatible handset has a good GSM signal reception. Unfortunately, while the level of clarity is outstanding when talking on the phone, the sound is a little bit lower than I previously expected. Furthermore, the vibration is good in intensity. The W902 Walkman bar phone features a medium-power ARM9 family processor that runs at speeds of up to 208 Mhz. The phone doesn't seem to be too snappy; in fact, compared to S40 Nokias, it lags big time. I think that the animated themes take their tolls on the phone's CPU. The handset comes with a 25MB internal memory, but features a micro M2 memory slot card to expand the storage space up to 8 GB. It has been placed under the back cover of the phone, but it can be inserted without the need of powering off the phone (hot-swappable). Moreover, the phone comes with an 8GB M2 memory card and an M2 USB adapter in the sales package. Sony Ericsson W902 belongs to the Walkman series, which makes it excel in multimedia features. After all, the best music phones are Sony Ericsson's Walkman-series devices, and W902 is not too far from the top. Boasting the famous Walkman 3.0 music player, the sound quality is impressive. Users can take advantage of a wide range of equalizers, which have been gifted with full visualization art this time. It supports almost all possible music file formats available on the market: MP3, AAC, AAC+, E-AAC+, WAV, WMA, M4A and MIDI. Furthermore, the music player is compatible with Album art function and, thanks to the integrated accelerometer, it takes advantage of the Shake control feature. The latter enables users to go one track forward or backward by pressing the Walkman button (on top of the phone) and shake the phone forward or backward. It is also possible to shuffle the playlist by simply shaking the phone both ways twice, while pressing the same Walkman button. Another new feature introduced by Sony Ericsson is called SensMe, which enables users to make their playlists according to their mood by simply selecting "Happy" or "Sad." The only drawback of the service is the fact that only the songs that are tagged by Sony Ericsson's Media Manager will be taken into consideration. If you want to use this feature a lot, you will need to transfer all your files through the Sony Ericsson Media Manager application, which could take a while. The stereo earphones (HPM-77) that are coming in the sales package are more than decent and include a 3.5mm adapter, which means that you can even attach your own headphones in case you're not satisfied by these. The candybar also includes an FM radio function with RDS, which can memorize up to 20 base stations. The reception and sound are also exceptional. Both, music player and radio can be run in the background. The integrated video player can run movies in full screen, in landscape or portrait mode, thanks to the accelerometer. You can also save certain frames from a movie if you like, in the form of screenshots. Overall, Sony Ericsson W902 has one of the highest sound quality levels in all the Walkman-series devices that have been launched on the market. Sony Ericsson W902 features a 930 mAh Li-Polymer battery that has an official lifetime of approximately 380 hours (360 hours for 3G) in standby mode and 9 hours (4 hours for 3G) in talk-time mode. After using the phone for at least 1 month I have decided that the battery's life is only half of what the official numbers show. Still, that is a very good autonomy for a medium-energy battery. If you are a heavy user you'll most likely need to charge it every 2-3 days, but a soft user will have no trouble keeping it for a week at least. The music playback time is of nearly 18 hours with the display in standby mode. Blackberry Bold 9000 runs Blackberry 4.6.0 operating system, platform 4.0.0. This is one of the latest OSes from Blackberry, but if you have an older one, it's usually better to update it to the latest version. The interface of the smartphone hasn't changed and if you already own one of RIM's devices this won't come up with anything new in terms of productivity tools. The only improvement that you cannot miss is the look of the interface, which is more eye-candy than its previous versions. Colors of the icons you'll find in the main menu are softly lighted in contrast with the dark background, and make a very good impression on the user. The usual Office package, called Documents To Go, developed by DataViz, is also included in Bold's operating system. Unfortunately, as you can see from the screenshots, you can only read or edit Word docs, Excel docs, and PowerPoint presentations, but need to pay if you want to make new documents. Instead of getting more new features that might not come in handy at all, RIM preferred to keep all the old stuff and give everything a shiny look. Not too bad, as Blackberry's all productivity tools are pretty solid. The phonebook can store an unlimited number of contacts, as long as your available memory allows it. Each contact can be filled with multiple numbers, e-mail addresses, birthday and anniversary information, a picture and a slot for both work and home addresses. There are also some games that you can play when you're bored: BrickBreaker, WordMole, Texas Hold'em King 2, Sudoku, Klondike. Of course, there's always the possibility to add more software, Blackberry or Java compatible. Finally, one of RIM's few devices that include the whole connectivity package: HSDPA 3.6 Mbps, Wi-Fi, EDGE and GPRS class 10. Fans of the brand can now benefit from any of the above-mentioned connections when needed. Although the integrated browser is not that good, as rich-in-graphics pages are loading pretty slowly, you can easily change it for the MiniOpera browser, which is perfectly compatible. Tested on EDGE and HSDPA networks, the device's results were pretty good: 120 Kbit/s download and 79 Kbit/s upload (EDGE), 1117 Kbit/s download and 321 Kbit/s upload (HSDPA). In terms of messaging Bold 900 features the standard Blackberry package. Should you either want multiple emails or instant messaging, this smartphone has it all. Unfortunately, you will be limited to BlackBerry Internet Service email accounts on the Storm. The same goes for the instant messaging application, which only features a proprietary BlackBerry service. Furthermore, to fully integrate the BlackBerry into a company's system, the installation of BlackBerry Enterprise Server (BES) is required. Synchronizing the smartphone with the PC can be made very easily with the Blackberry Desktop Manager. The transfer is very fast, should you either be syncing emails and messages or simply filling your smartphone with music files. If that is still not enough for you, then note that Bold 9000 also features a built-in GPS receiver with A-GPS support and BlackBerry Maps. The GPS module works perfectly and completes the technical features of a smartphone that has all the BB fans wanted included in a single device. Blackberry Bold 9000 is a quad-band GSM (850 / 900 / 1800 / 1900) and tri-band HSDPA (850 / 1900 / 2100) smartphone, which features GPRS, EDGE, and HSDPA. Other connectivity tools include the Bluetooth 2.0 with A2DP and the miniUSB for PC synchronization (including charging). The call quality is exceptionally good, almost impressive. You'll thus be able to talk on the phone even in more crowded areas. The GSM signal is also very good on the EDGE network, as well as on WCDMA. Blackberry Bold 9000 is powered by a single Intel XScale 624MHz CPU, which makes it one of the fastest BlackBerries up to date. While modern Blackberries incorporate ARM9-family processors, there are some that are added ARM7 CPUs, which are a little bit slower. Unfortunately, this is showing especially when browsing the menu, using multiple applications and especially when 3G connectivity is used. I have experienced some lockdowns when I have tried to open multiple apps within the device's menu. Overall there are some hiccups that could've been avoided if a more powerful CPU had been embedded. The smartphone embeds 1GB user free internal storage memory and 128 MB Flash memory, which makes data processing much faster. Storage space can be expanded up to 8GB through the hot-swappable microSD slot card. The sales package also contains a 1GB microSD card, depending on the location. There's not much to tell about the multimedia just that it bears the same conservative and business-like look, which is quite understandable as it comes from a business smartphone. The built-in music player supports album art features, but lacks any Equalizers. It supports MP3/WMA/AAC+ music files, which can be sorted by Artist, Albums and Genre. Users will be able to make their own playlists within seconds. Furthermore, even if these are only basic features, I was surprised to find out that the quality of the sound was pretty high, especially when using your own headphones. Thanks to the 3.5mm port you can now change the included headphones, which are not that bad though. One more drawback that I noticed was the missing Repeat feature, which was present in previous models. The music player can be minimized to the background and listening to music through the stereo Bluetooth feature is also possible. The external speaker is very loud and pretty clear, but the lack of an Equalizer makes the music sound pretty much the same, regardless of the song played. Overall, multimedia features are surprisingly good for a business phone, and especially for a Blackberry device. The 1500 mAh Li-Ion battery has an officially stated life expectancy of 310 hours in standby, and of about 5 hours in talk-time mode. Our test unit made it for about 4 days at medium use. Heavy users will need daily charging or 2-3 charges per week. The autonomy is pretty acceptable for a Blackberry owner that only uses the specific Blackberry services, namely messaging capabilities.